University of Notre Dame, B.A., J.D. As President and CEO of Fidelity Sports Group, LLC., David J. Moorman draws on his 28 years of sport marketing experience to bring valued advice and counsel to his clients. During his career, David has been fortunate to have worked with numerous world class athletes such as the late great golfer Payne Stewart, major golf championship winners Lee Janzen, Mark Calcavecchia and Paul Azinger, baseball’s Orel Hershiser, Frank Thomas and Chipper Jones, legendary football coaches Joe Gibbs and Dan Reeves and motocross icons, Ricky Carmichael and James Stewart. David has negotiated hundreds of endorsement, licensing, appearance and media agreements for professional athletes that have exceeded $100 million. Since his start in the sports industry in 1989, David has set new standards in structuring and negotiating corporate agreements for professional athletes. Furthermore, for such athletes, he has developed and executed strategic marketing plans, monitored promotional and public relations activities, and coordinated worldwide schedules. His dedication, commitment and care based approach to managing business allows his clients to maximize their commercial value in the marketplace while at the same time allowing them to focus on what they love the most – their family and career. His own love of golf earned David a scholarship to the University of Notre Dame, where he graduated in 1984 with a Bachelor of Arts degree. While at Notre Dame, David was elected captain of the golf team, earned three varsity letters and received student athlete academic honors. Thereafter, he studied international law at the Notre Dame/London Law School during the summer of 1985, and ultimately earned a juris doctorate degree from the University of Notre Dame School of Law in 1987. After law school, David worked for the prominent Texas based law firm Fulbright and Jaworski before joining Leader Enterprises, Inc. in 1989. There, its founder and esteemed sports lawyer, the late Robert Fraley, introduced and mentored him in the field of sports management and marketing. While at Leader Enterprises his dedication and accomplishments earned him the role of Vice-President of Client Services. In 1997, David co-founded SportsLink Consulting and as its managing partner built a successful and profitable firm servicing professional athletes for eleven years. Besides his passion for sports, David enjoys traveling with his family and participating in Christian sponsored charitable activities. 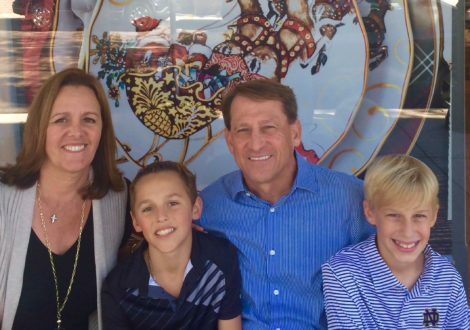 Born in Muncie, Indiana, David currently lives in Orlando, Florida with his wife Kelly and their sons Tyler and Matthew.